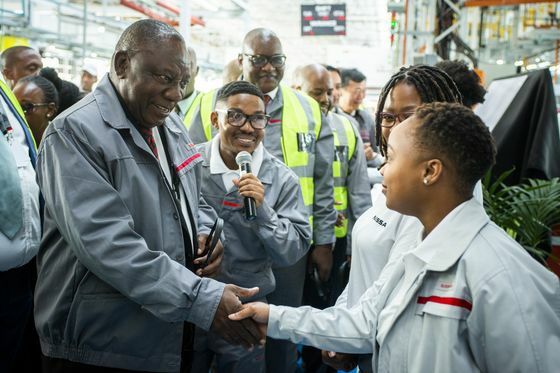 (Bloomberg) -- Nissan Motor Co. plans to invest a further 3 billion rand ($215 million) in its South African plant, the first major automaker to commit further to the country since the government renewed an industry manufacturing incentive plan last year. The decision by the Japanese carmaker to produce the new Navara pickup at its plant north of Pretoria may add 30,000 units to its current annual volume of 35,000, Mike Whitfield, managing director of Nissan Africa, said at the factory on Wednesday. Production of the Navara from 2020 will also create about 400 direct jobs in a country which has an unemployment rate of 27 percent. Nissan’s investment follows an agreement by international firms and the government to extend the ongoing incentive program through 2035. The plan has also seen the likes of Toyota Motor Corp., Volkswagen AG and BMW AG operate plants in the country, in return for generous tax breaks. The majority of vehicles are produced for export, with Nissan sending cars to 45 other countries. The 15-year extension will be “critical” to Nissan’s ability to make new investment decisions, Whitfield told reporters. All carmakers “have access to the same incentives -- we are optimizing what has been put in place,” he said. Nissan plans to more than double its industrial reach in the Middle East, Africa and India by 2022 by adding more factories, Peyman Kargar, chairman of the carmaker’s operations in those three territories, said at the same event in South Africa.